Lanie Goldberg ( JV Girls) took a W in the 3rd Norcal race of the year. 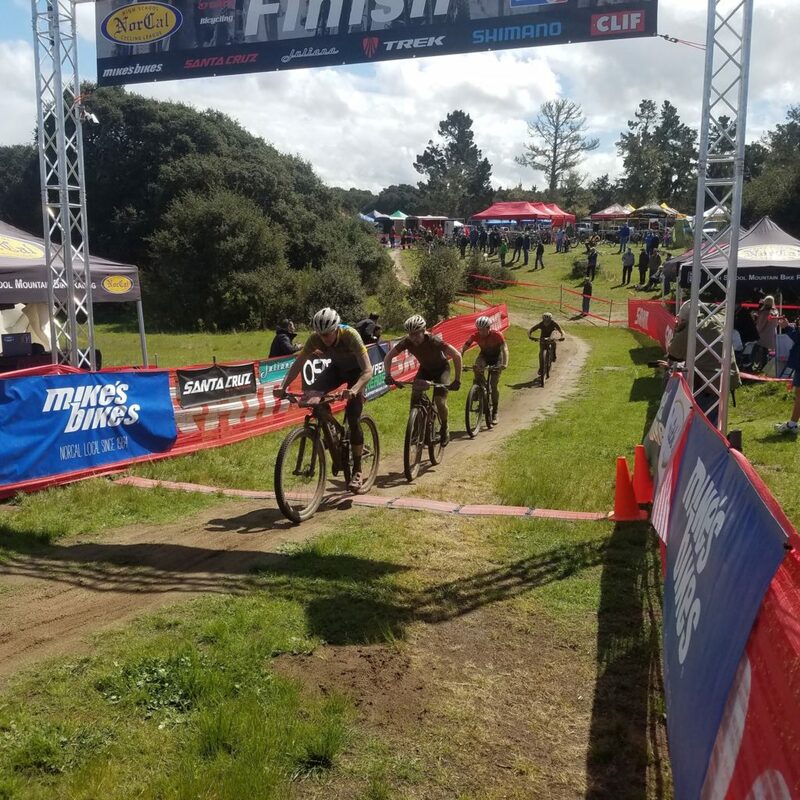 Lanie’s form has been improving every race and even after overcoming a slipped pedal at the start she quickly fought her way back to the front and descended like a BANSHEE to gain a small advantage in Lap 2. A tangle with the other lead rider while going for a corner into a singletrack section caused her to fall, but she quickly got back on and chased. Unfortunately the series leader suffered a minor mechanical on the top of the last climb of the day allowing Lanie to take the lead again and notch her first W of the year. Quick rant: We would LOVE to see the girls race the same distance as the boys, especially in the JV and Varsity classes. In a race without much climbing (500 ft/lap) they deserve a race that rewards endurance and has enough length to develop. Varsity Boys are a stacked group this year with some awesome new blood coming into the front group! Race rolled out in a driving cloudburst and quickly Noah Hayes took the front, alternating with Max Mcfadden and blowing it into a small group. Both Noah and Max have been building back fitness since CX nationals this January and were SMASHING. Along with newcomers to the group Roberto Cribley and Nathan Davis this group powered away on the fairly tactical course. In the end it was Noah prevailing over Max by a few feet after a hard fought battle. 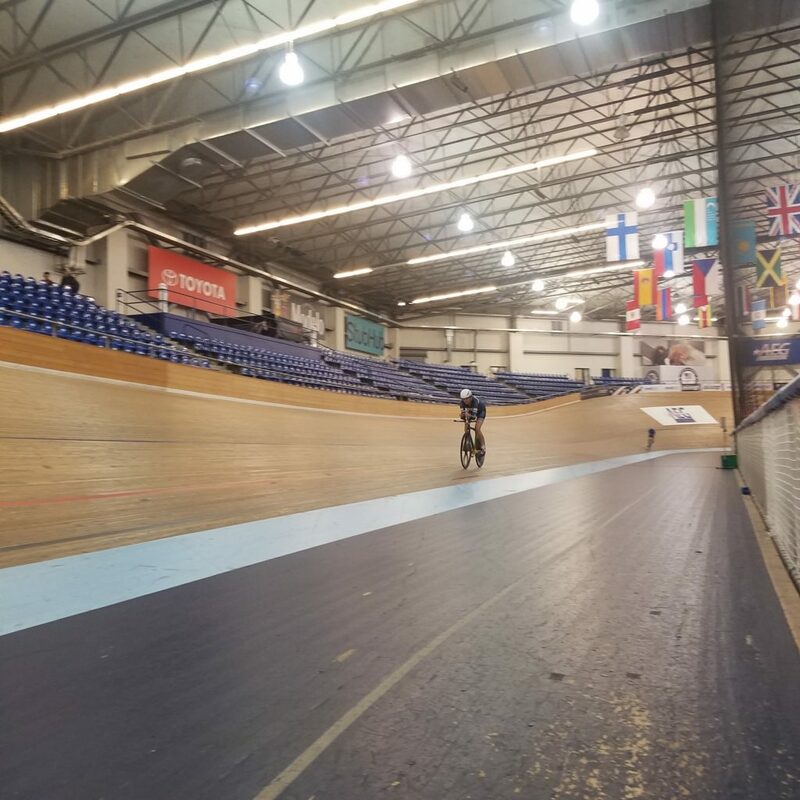 The Los Angeles Velodrome Association puts on Timed Events every month or so as a prep event for Nationals and Worlds, or simply to check in on fitness/ get used to equipment at race speeds with a start gate, etc. We used this session to set a new PB for Bev Chaney in the 200M, try out some gears and techniques in the 500M, and refine her position while both on her rollers on the infield and during her 2000M Individual Pursuit. We were able to use the LEOMO motion analysis system to pull data about pedaling imbalances that we can address in drills and more fitting in the future. Bev also put up a FANTASTIC time in the 2K, boding well for the summer goal events.